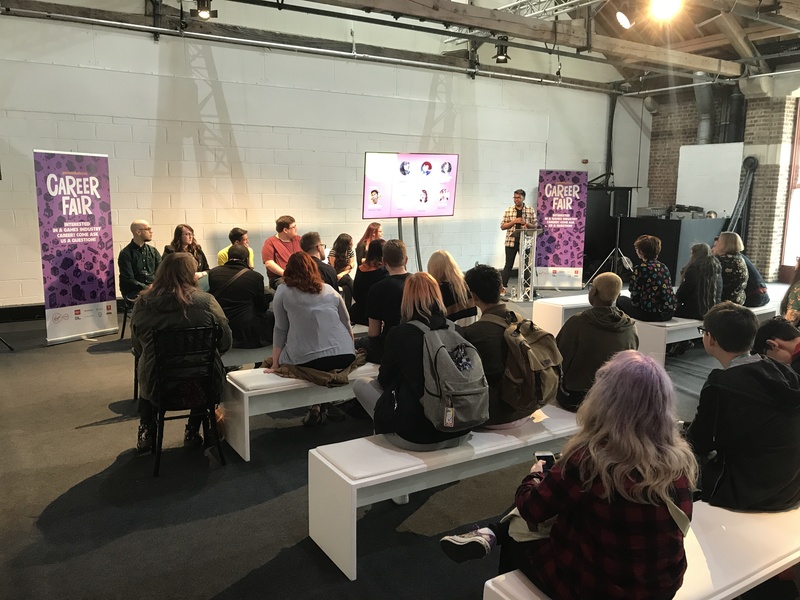 Diversity is an ongoing challenge for the industry, and while it needs to be improved for the benefit of those already working in games, it's also key to cultivating a welcoming environment for future talent. 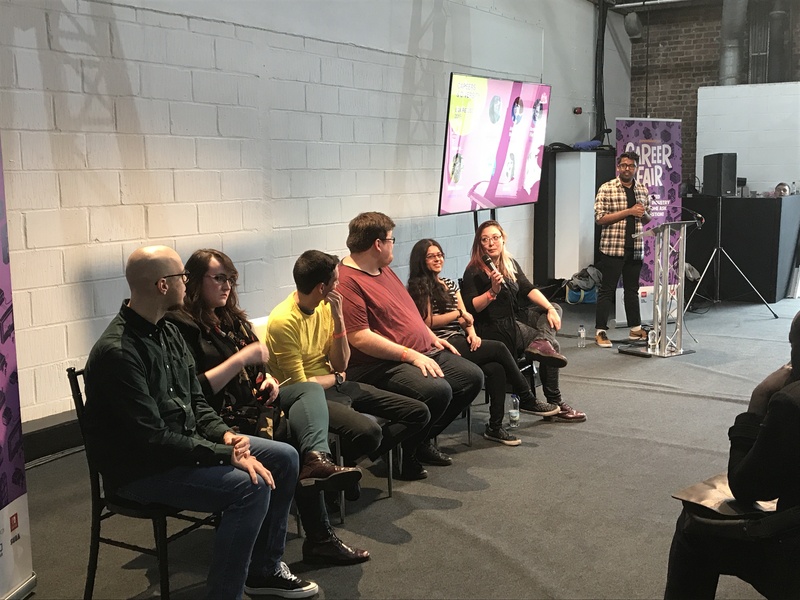 As such, last week's GamesIndustry.biz Career Fair during EGX Rezzed brought together a panel of developers from a variety of UK studios to discuss the issue. Chaired by games journalist Mahin Kesore, it saw the panelists sharing both their own experiences and their advice. Reflecting on their early days in the industry, the developers acknowledged that entering a games workplace can seem daunting. UX designer Nida Ahmad grew up in an area of East London where black and Asian minorities were the majority, leading to a culture shock when she went to a university with a different mix, but said she has been "very lucky and privileged" with her entry into games. "[People of colour] make up about 4% of the games industry -- for TV and film, it's about 30%. We are lagging behind and there's a lot of changes we need to make"
"We only make up about 4% of the games industry -- that is very, very low compared to TV and film, which is about 30%. So we are lagging behind and there's a lot of changes we need to make." Dr Studios senior artist Amanda Blatch added: "I was part of the film industry before I ever made it into games, and it was a little bit of a culture shock traversing over into games and not having as much diversity as films had when I was working there. You hear stories, but at the end of the day I wanted to get into this industry so I pushed for it, no matter what was going to happen, and I'd take the problems along the way." Mediatonic senior writer and designer Ed Fear noted that the first two companies he worked at were small -- roughly 30 to 50 people -- and were, "very, very masculine, testosterone type places." "I was the only gay person," he said. "Personally, I was okay because I was very assertive and I had the quite ridiculous confidence of youth. But I can certainly see how it could be like that -- games development did used to be a kind of lads' environment. I know it doesn't sound like it. Everyone thinks it's a load of geeks, but it's also a load of geeks that are men, so there is that kind of laddish culture." Fear went on to say things are much better at Mediatonic, which even has an LGBT group with 17 members. But while his own experience has improved, the industry's troubles are far from over. He shared the story of a fellow writer who wanted to put a gay character into a game, but a large publisher told him not to. "If you read diversity articles on something like Eurogamer, you get a lot of people in the comments going, 'oh, all of these are old problems, they've solved these issues.' The truth of the matter is they really aren't, and they're something we face on a day-to-day basis." "You get a lot of comments going, 'oh, all of these are old problems.' They really aren't, they're something we face on a day-to-day basis"
Game designer and guest lecturer Rareș Cristian Filip Chiriță said one of the biggest challenges he has faced has been cultural differences. For a start, he had to actually change his name to Chris Filip -- an abbreviation that bypasses the problems he encountered with people struggling to pronounce his first name. In fact, despite the fact that he is fluent in English, language still became something of a barrier as co-workers would fixate on how well he spoke in their native tongue. "That's why I tended to gravitate towards remote work, because there it's all about what you can write, how you express yourself and what your skills are," he said. "Something else I haven't seen discussed a lot more is cultural norms. In Romania, when you get into work you shake all the guys' hands, and again when you leave. When you meet women, even if it's the first introduction, you don't shake your hands, you kiss their cheek. It took about three months of working in a UK company for someone to tell me we don't do that every day or someone might be uncomfortable with that. "Those are things I had to learn and get past. When you get somebody from a culturally diverse language, do make sure you have that same language and understand what the customs are." Weather Factory's head of marketing and PR Claire Sharkey has held two jobs where she was the only woman in an office of around 20 men, and, as you can imagine, encountered issues with the atmosphere this created. "Something I had to learn was you can be chilled and laid back, but some people are so dumb they don't realise there's a line," she said. "That you can be friendly and social but there's a line where your dialogue and conversation might cross. In these environments, I've been able to hear a lot of things that aren't very cool and they think is okay... Fortunately, now I'm at Weather Factor and we're primarily a female-run studio, which is great. We've plenty of LGBT members, so that's great as well." "It's important to find your tribe as a means of support and doing something to change things, but it's also important to reach out to everybody"
Kesore asked the panel for any advice they would offer women, people of colour, or anyone from any sort of minority group who hope to enter the industry -- a theme rapidly emerged. "Find your people, find your tribe," said Ahmad. "Find people who have had similar experiences to you, or are from a similar background. I've been here about two to three years and it's only now I'm meeting people who look like me, who have similar experiences to me, and it helps you so much. "These people can help you go through tough times and will understand things that other people won't. You need that in this industry because the work can be quite hard sometimes, but to have this [support] is really good, especially for your mental health." Fear agreed, adding that you should not only find your tribe, but organise it. He admits that he wasn't initially in favour of starting the LGBT group at Mediatonic -- if only because he was "a little bit unsure about what knock on effect it might have" -- but now describes is as, "one of the greatest things that's happened in my time there." "It's great for when someone's new, because we're a studio of over 150 people so it's very difficult to come in and be new," he said. "If you come in and join a much smaller group of people, it's easier to get to know people, which really helps. And we really try to encourage each other to be vocal about things. It's really important to have people pushing you on and saying, 'These are things that are worthy of bringing up if you're not okay with it.' I would certainly encourage you if you're in a workplace that doesn't have a group to see if you can start one, even if it's unofficially because there really is strength in numbers." "Privilege and society is often stacked against us, but at the same time it feels like there are more sideways routes into the industry than ever before"
Sharkey added: "It's important to find your tribe as a means of support and doing something to change things, but at the same time I think it's important to reach out to everybody. There are people that will have issues... but we can't fix problems if we just contain the dialogue to one group. If the people who are part of the problem aren't being exposed to this, nothing will really change. "Finding your tribe is a great piece of advice, and then if you get to a stage where you're more comfortable, start expanding a bit more, trying to get more people's opinions, and reaching out to people." This also extends to reaching out to people beyond your own company. Ahmad described Twitter as an, "amazing [place] to build your community," praising the support of game developers on the platform. Blatch added: "I usually refer to people as allies rather than tribes, because it's not really a group or organisation as such. I find allies within my company and on Twitter a lot, because the good and bad thing about Twitter is you can really see a person's true nature. And you talk to people and find out what kind of person they are, make friends with them. "Recently we hired someone that we were mutual [followers] on Twitter, and we just connected easily in the group dynamic really quickly because we already respected each other. It was nice and easy, whereas usually when I go into a company and I don't know anyone, you never know what sort of people are sitting there, how they're going to treat you and so on. That's one of the scariest things about moving companies -- you don't know whether it will be better or worse without doing extra research." The panel also touched on the idea of class and privilege creating other minorities, with the example of those who cannot afford university education before seeking a career in games. Fear observed that, thanks to the rise of free game engines and other tools like Twine, there has, "never been a better time to be able to make a game without any money." UX and UI specialist Jim Unwin concluded: "The idea that you need a degree or need to go through formal education seems less and less relevant -- or at least you seem to have more and more alternative options. You can now fairly cheaply get out there and just start making stuff. And to be honest, if you're going to an interview and you can show games rather than a diploma, that makes a massive difference. "Privilege and society are often stacked against us, but at the same time it feels like there are more sideways routes into the industry than ever before." This panel was really great for me and so interesting to hear all the different sides of diversity within the games industry. I was taking notes myself! haha!